Republished April 5, 2017, 2:30 p.m. to correct natural gas units on second figure. Primary energy consumption in the United States in 2016 totaled 97.4 quadrillion British thermal units (Btu), a slight increase from the 2015 level. Consumption of coal decreased by 9%, nearly offsetting increases in the consumption of renewables, petroleum, natural gas, and nuclear fuel. Fossil fuels continue to account for the bulk of U.S. energy consumption, and the consumption of petroleum and natural gas both increased in 2016. However, those increases were more than offset by lower coal consumption. Overall, fossil fuels made up 81% of the United States’ total energy consumption in 2016, slightly lower than 2015 levels, but down from 86% in 2005. Petroleum consumption increased to 19.6 million barrels per day in 2016, led by increases in the transportation sector. 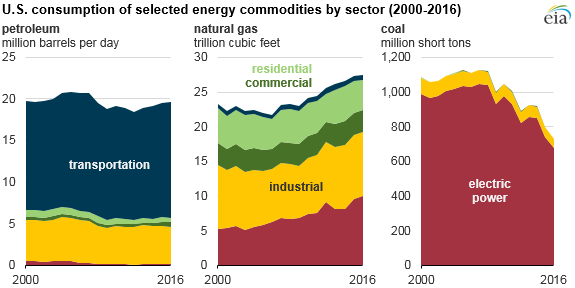 Natural gas consumption increased to 27.5 trillion cubic feet, led by higher demand in the electric power and industrial sectors. Natural gas consumption in the residential and commercial buildings sectors fell slightly, reflecting lower heating demand. Coal consumption fell to 730 million short tons in 2016, the third consecutive year of declining coal consumption. Coal consumption decreased in the electric power sector by 61 million short tons (8%), while industrial sector coal consumption fell by 6 million short tons (11%). Nuclear fuel consumption in the United States increased 1% in 2016. The number of total operable nuclear generating units briefly increased from 99 to 100 when Watts Bar Unit 2 in Tennessee came online. Later in the year, the retirement of Nebraska’s Fort Calhoun nuclear facility brought the number of nuclear units in the United States back to 99. Year-end 2016 nuclear capacity was slightly higher than in 2015 (99.3 gigawatts versus 98.7 gigawatts), and annual average nuclear capacity factors, which reflect the use of power plants, were also slightly higher, at 92.5% versus 92.3% in 2015. Renewable fuels had the largest increase in energy consumption in 2016. Wind generation increased by nearly 20%, making up almost half of all renewable consumption increases. 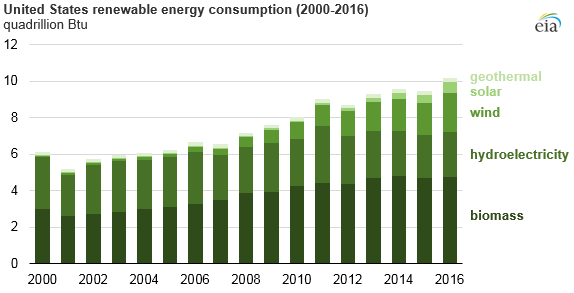 Solar consumption also significantly increased, as considerable electric generating capacity was added for both wind and solar resources in 2016. Hydroelectric consumption increased by 7% as the West Coast recovered from severe drought conditions. Together, wind, hydro, and solar made up 91% of renewable consumption increases. Biomass consumption, which accounted for 47% of all renewable consumption in 2016, remained close to its 2015 level. More information about total energy consumption, production, and trade is available in EIA’s Monthly Energy Review.